. :: Hot Club Philly ::. A word about the music and its origins. 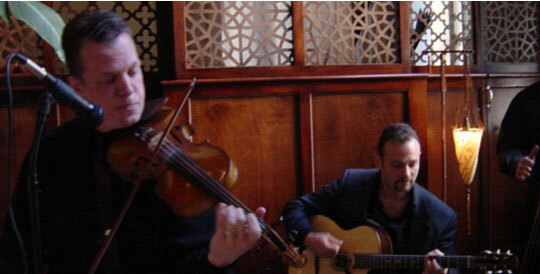 The Hot Club of Philadelphia plays music often referred to as Gypsy Jazz, Based on the recordings of Belgian born Gypsy Guitarist Django Reinhardt and French Violinist Stephan Grappelli. Django was one of the most influential guitarists of the 20th century.Born in a traveling Gypsy caravan in Liberchies Belguim on Jan. 24,1910 He was self-taught, and could not read or write music. Django was illiterate, [ he eventually learned to write his name]. Coming from the Gypsy tradition, he was used to living outdoors, he didnt sleep indoors or own a suit until he was in his twenties. A true original, with many idiosyncrasies, he was the subject of many myths and stories. He captured the imagination of writers and film makers, including a mention in the novel From Here to Eternity, by James Jones. Woody Allens brilliant 1999 release Sweet and Lowdown, the main character guitarist Emmett Ray, [played by Sean Penn], is a Django Reinhardt wanna-be. [The guitar parts in the movie were played by Howard Alden]. The film has introduced Djangos music and story to an entirely new audience.